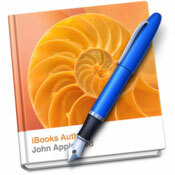 Somehow I missed the announcement of iBooks Author last week. TechCrunch published a list of “subtle details” from Apple’s announcing event. Engadget published a helpful hands-on illustrating the interface with lots of photos and a video. Huffington Post has excerpts from the end-user license agreement and legal analysis. ArsTechnica has a good collection of reactions to the restrictions. Mashable has a brief comparison chart identifying the competition. In short, the tool is free, and with it, you can create media-heavy ebooks. If you want to sell the books you create with the tool, you can only sell the books through Apple. And, oh yeah, these aren’t epubs. GigaOM has reported on a webcomic author who has already used the tool to create and distribute (for free!) a collection of his work. Download it from Richard Stevens’ website. You’ll see the file type is .ibooks. So… basically, even if you’re creating a free book, you can distribute the book however you like, but it’s still limited to iBooks rendering, is that right? Certainly, this is a useful, boundary-breaking tool, and folks like John Gruber have done a great job explaining why it’s in Apple’s interest to pursue a proprietary format. I have to say, though, this does not sound like the answer. We haven’t test-driven iBooks Author yet. Please let us know if you have!